Quality Management and Training Ltd (QM&T) as a CQI/IRCA Approved Training Provider (ATP) are happy to announce the launch of the following CQI and IRCA Certified courses in Quality and Auditing. The CQI is the only chartered professional body dedicated entirely to quality. IRCA is its specialist division dedicated to management system auditors. The CQI have recently launched their new portfolio of CQI and IRCA Certified courses, which on successful completion of each course unit, students will receive a certified certificate from CQI/IRCA and QMT. Please contact QM&T if you are interested in any of the courses below. For the Foundation level courses, there are no exams, but for the Practitioner and Professional level courses, students would need to sit an exam. Exam Centres available include, Guildford, Coventry, Leeds and Scotland. Click here to see more details. CQI and IRCA Certified courses are independently assessed by the CQI and IRCA, the two leading professional bodies for quality and auditing and can only be delivered by CQI and IRCA Approved Training Providers such as “Quality Management & Training Education Centre” (QM&T). CQI and IRCA Certified courses are mapped against the CQI’s Competency Framework for quality, so that your learning is aligned with the skills and knowledge required by the profession. CQI and IRCA Certified courses are delivered by QM&T as distance learning course, enabling you to study in your own space and time. CQI and IRCA Certified courses provide you with knowledge and skills to support your application for membership of the CQI. Membership is an invaluable way of demonstrating your competence and commitment to quality. On completion of all the Practitioner level course units (excluding PT236), delegates will be awarded the Practitioner Certificate in Quality Management. Foundation 7–16 hours These courses will provide students with a basic awareness and understanding of the relevant topics and knowledge. Those who are new to quality or currently work in a different function or business area. Practitioner 14–24 hours These courses will provide students with a full understanding of the relevant topics and knowledge, and enable them to apply this knowledge. Those who are currently practising in quality and are aspiring to middle management. Professional 24–40 hours These courses will provide students with a full understanding of the relevant topics and knowledge, and enable them to apply this knowledge. Those who are currently practising quality at a mid to senior level and are aspiring to leadership or senior management. CQI and IRCA Certified QMS Auditor Training courses will equip you to assess the conformance and performance of an organisations’ quality management systems. This course teaches you the process approach, the eight quality management principles and the requirements of ISO 9001. This course provides understanding of the fundamental tools, techniques and structured methodologies for problem solving. Students should leave the course with the capability to participate as a member of a problem-solving team in the application of the key tools within a small scope business problem or task, enabling them to support the development of robust and sustainable solutions. This course should provide awareness of the fundamental tools, techniques and structured methodology for risk management across a broad range of organisational contexts. Students should leave the course with the capability to participate as a member of a team in the application of the key tools within their organisation. This course provides awareness of the key considerations and approaches to enable effective change in organisations. Students should leave the course with the ability to explain to others how understanding organisational change can be used to develop an approach capable of sustaining improvement in customer and stakeholder satisfaction. This course should provide awareness of the fundamental tools, techniques and structured methodology for Product and Service Management across a broad range of organisational contexts. Students should leave the course with the capability to participate as a member of a team in the application of the key tools within their organisation. 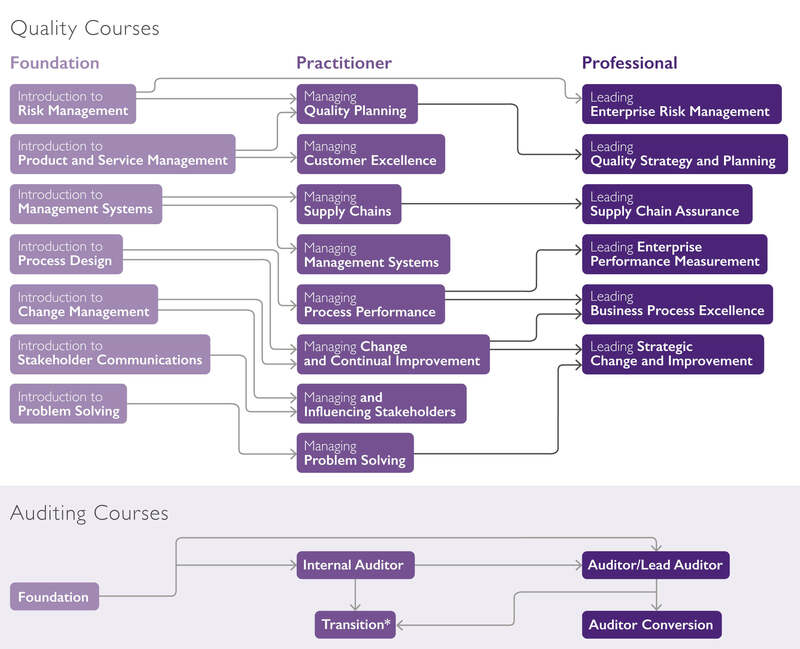 This course provides fundamental skills for process design and standardisation. Students should leave the course with the capability to understand customer and stakeholder requirements and define standardised processes to deliver them. This course should provide students with an awareness of management systems in general. Students should leave the course with the capability to explain to others how customer and stakeholder requirements relevant to their organisation can be used to develop a management approach focused on sustaining improvement in customer satisfaction. This course provides development of key skills in communicating, influencing and negotiating across a broad range of organisational contexts. Students should leave the course with the capability to evaluate and improve both their own communications and those of others within their organisation. This course aims to provide delegates who have an existing, basic knowledge of, or experience in, environmental management with an understanding of the management systems approach and the requirements of ISO 14001, and to provide a basis for delegates who wish to go on to complete CQI and IRCA Certified EMS Auditor Training courses. CQI and IRCA Certified QMS Auditor Training courses will equip you to assess the conformance and performance of an organisations’ quality management systems. This course teaches you how to plan an audit, how to audit a process and how to report an audit. This course will provide practical skills development in the management of process operation and performance. Delegates will leave the course with the capability of leading teams in the development of their management processes and be able to develop a set of performance measures that indicate how well operational processes meet customer and stakeholder requirements. This course includes a one hour multiple choice examination. This course will provide practical skills development in the management processes required to implement management systems. Delegates will leave the course with the capability of working with their organisation and other quality professionals to support the development of their management system and associated management processes using a process-based approach, risk-based thinking and PDCA in a systems context. This course includes a one hour multiple choice examination. This course will provide practical skills development in the management of change in the context of process management and improvement. Delegates will leave the course with the capability of leading teams in the development of their improvement approaches and be able to facilitate the management of the associated changes. This course includes a one hour multiple choice examination. This course will provide practical skills development of the fundamental tools, techniques and structured methodologies for problem solving. Delegates will leave the course with the capability to lead a problem-solving team in the application of the key tools within a small scope business problem or task, and to lead the development of robust and sustainable solutions. This course includes a one hour multiple choice examination. This course will provide the practical skills required to manage a broad range of supplier activities. Delegates will leave the course with the capability to assess the approaches taken by suppliers, support the selection of suppliers, measure supplier performance, manage supply chain risks and encourage suppliers to take a process approach to management and drive improvement. This course includes a one hour multiple choice examination. This course will provide the practical skills required to identify the different types of customers and stakeholders, gain knowledge and insight into their various types of requirements and the skills required to translate these requirements to their organisation’s governance, assurance and improvement processes, therefore delivering customer excellence. Delegates will leave the course with the capability to use customer feedback and information from the external environment to enhance and innovate their organisation’s products and services. This course includes a one hour multiple choice examination. This course will provide practical skills development in product/service management in the early phases of the product/service lifecycle. Delegates will leave the course with the capability of working with teams to deploy an integrated project based approach to product/service quality planning and risk management, in order to meet customer and stakeholder requirements through innovation, concept design and development of products and services. This course includes a one hour multiple choice examination. 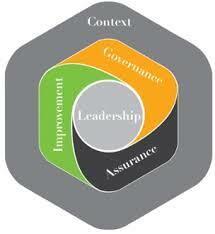 This course will provide practical skills development in influencing and managing stakeholders. Delegates will leave the course with the capability to effectively apply a range of tools and techniques when working with customers, stakeholders, top management and external providers/suppliers to increase their readiness to change and overcome resistance. This course includes a one hour multiple choice examination. CQI and IRCA Certified Professional level courses provide delegates with a full understanding of leadership and senior management level quality topics and show them how to apply this knowledge in their organisation and industry. These courses are designed specifically for people who are currently practising in quality and are aspiring towards leadership or senior management. These course are not yet available. Click on the courses below for details. The aim of this course is to provide delegates with the knowledge and skills required to perform first, second and third-party audits of quality management systems against ISO 9001, in accordance with ISO 19011 and ISO/IEC 17021, as applicable. Delegates who complete this CQI and IRCA Certified ISO 9001:2015 Lead Auditor (QMS) course successfully (within the three years prior to making an application to become a certificated auditor) will satisfy the training requirements for initial certification as an IRCA QMS auditor.